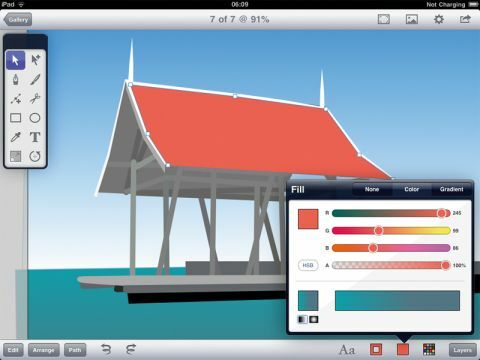 From the team who brought you Brushes, comes this fantastic vector illustration app for the iPad. Vector images are made using shapes and lines to create paths, rather than colouring in pixels, and so are perfect for technical illustrations and logos as they can be scaled without losing quality. Inkpad shares many functions with apps such as Adobe Illustrator, and its path creation and manipulation tools will be familiar to Adobe CS users. Working with paths and anchor points can be tricky for novices, but with Inkpad's easy-to-use tools and a bit of practice you can get drawing quickly. For more experienced users, Inkpad is incredibly intuitive – especially using a stylus – and makes you feel like you're more hands-on with your artwork. Advanced tools such as merging and slicing paths, editable gradients for colouring shapes, and multiple layers means creating complex images is surprisingly easy. Files can be exported as JPEG, PNG, PDF or SVG, so work can be continued on your Mac. But Inkpad lacks more precise functions. For example, there's no measuring tool or info palette for working out exact dimensions and the text editing options are limited by the iPad's incompatibility with non-Apple fonts. Still, at just £2.99 Inkpad is a bargain and essential for any creative iPad user.